A new report from Standard and Poor’s Rating Services titled “Carbon Constraints Cast A Shadow Over The Future Of The Coal Industry” was published on Monday, July 21st. Written by primary S&P analyst Elad Jelasko and three colleagues, the report takes a long, hard look at the future of the coal industry and offers investors a variety of useful perspectives on the sector. Coal has fallen out of favor as a fuel source in the U.S. and Europe over the last few decades because burning coals creates both CO2 and particulate pollution (41% of global carbon emissions come from coal). That said, coal still represents 30% of the total global energy produced and 40% of power generation worldwide as China and other countries have dramatically ramped up their coal consumption over the past 20 years. Furthermore, over 1,200 coal-fired power plants are in operation globally, including more than 450 in India and 360 in China. Keep in mind the average life of these plants is close to 40 years. Global coal consumption increased by 3.9% a year on average between 2000 and 2013, with a 3% rise in 2013, with total consumption just topping 8 billion tons. Moreover, according to the International Energy Agency (IEA), even though growth is slowing down, coal will still become the world’s top source of energy within a few years. Of note, China produces and consumes about 45% of global production, with almost 60% of the coal burned for electricity generation. 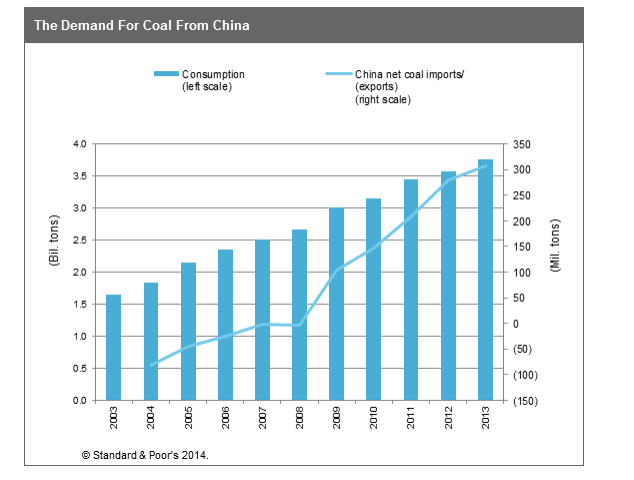 The S&P report also notes that China has increased its coal demand by 7.5% per year between 2005 and 2013, and is the largest global consumer of coal, representing 45% of total consumption. The rapid growth of coal has created a huge boom in CO2 production and has led to severe air pollution in industrial provinces and problems with clean water in some areas. Given these circumstances, the Chinese government has recently introduced new regulations to control climate change by 2020. One initiative involves reducing coal consumption as a percentage of total energy use to less than 65% by 2017 (from around 67% in 2012). 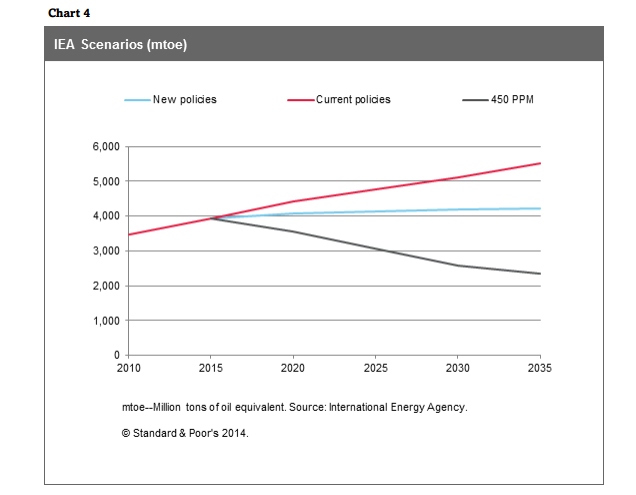 Jelasko et al, however, argue that the new initiatives will not “trigger a fundamental change in China’s energy profile, and more steps are needed between 2020 and 2030 to meet the IEA’s 450 ppm scenario.” They also note it’s important to remember that coal use targets may change over time.